Problems with your browser extension? If Dashlane is working in one browser, but does not seem to work at all in Internet Explorer, or if Dashlane stopped working completely, you may need to check your extensions to make sure Dashlane is installed. In order for Dashlane to operate, you should see the Dashlane icon in your browser's toolbar and it should have a green light. 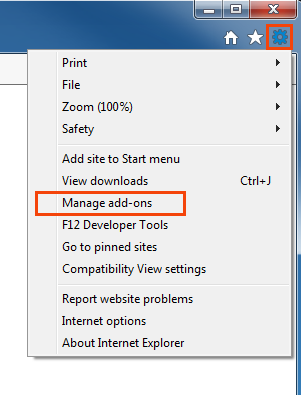 Please note that there is no Enhanced Menu when clicking on the extension button in Internet Explorer. 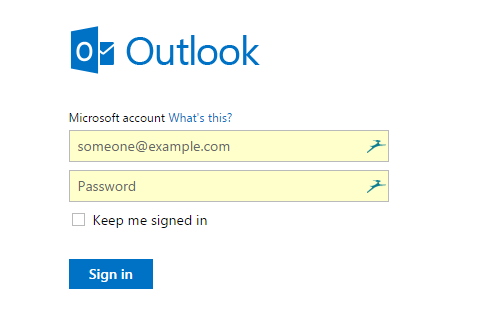 The extension button simply logs in or logs out of your account. The Enhanced Menu is unfortunately only available on Firefox, Edge, Safari, and Chrome. If Dashlane’s icon has a red light, quit all Internet Explorer windows then open the Dashlane application and wait for a few seconds. If the red light remains, please proceed. If Dashlane's icon is grayed-out, spinning or if there's no icon at all, something went wrong. 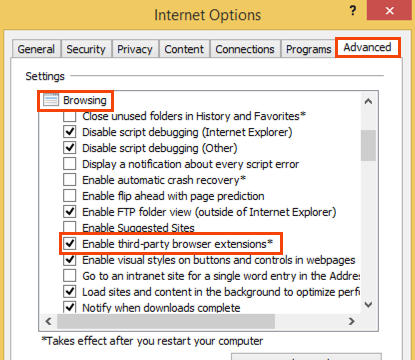 What you should do is re-installing your browser extensions, and we are going to show you how! Please first make sure that your extension is active in the add-on / extensions list of your browser. If the Dashlane extension is already active, please try to close and reopen Internet Explorer, or to disable and reactivate the extension. In order to disable the extension, please click on Dashlane Toolbar in the list, then Disable at the bottom right corner of the window. If it still does not work, or if the extension is simply missing from the toolbar, here is how to re-install the Dashlane extension in Internet Explorer. 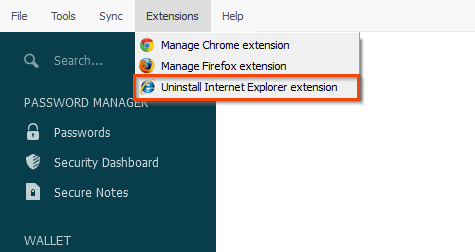 Choose Uninstall Internet Explorer extension (if you are prompted to Install Internet Explorer extension instead, install it and you are done here). Note: this is for Windows users only. 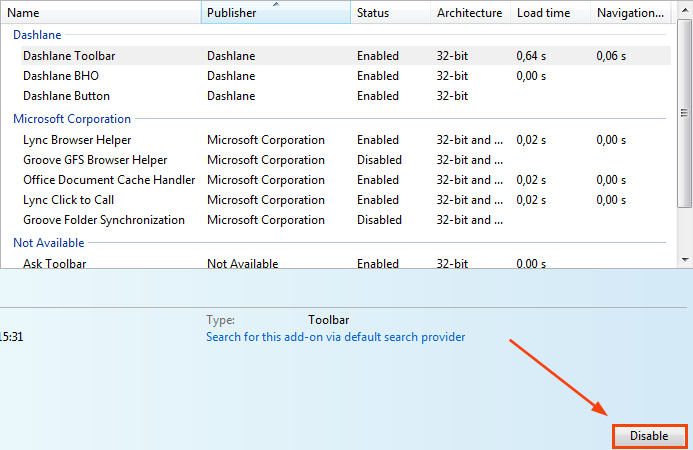 Dashlane cannot work if Internet Explorer is launched in Windows 8 mode – which means not from the Windows 8 Start screen. This special version of Internet Explorer does not support any browser extensions yet. Please launch Internet Explorer from the desktop to use Dashlane. Open Internet Explorer using the shortcut on your desktop (not from the Windows 8 Start screen if you are running Windows 8). Once you have launched Internet Explorer, if there is no Dashlane tool bar, click on the Tools button (which is the cog icon) and select Internet Options. Then select the Advanced tab and scroll down until you see the Security section. Make sure that Enable Enhanced Protected Mode is not checked here. If it is enabled, please disable it and click OK.
Close Internet Explorer, open Dashlane and select Uninstall Internet Explorer extension from the Extensions menu. 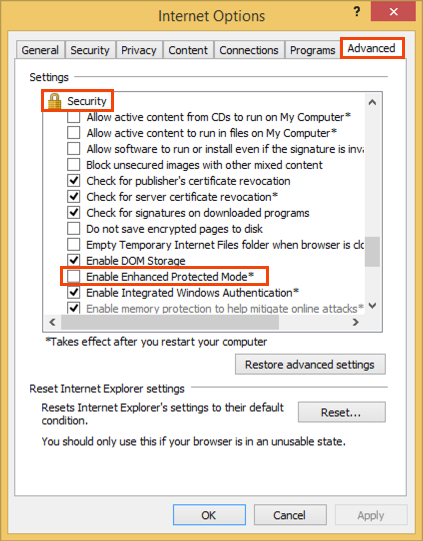 Now restart your computer – this is very important to make sure Internet Explorer is launched with the right settings – then open Dashlane and this time, select Install Internet Explorer extension. Open Internet Explorer. You should now see the Dashlane tool bar and the red light will turn green after a few seconds. If it still does not work, you may need to restart your computer once again before this takes effect. If your Dashlane tool bar still does not appear in Internet Explorer, please make sure that you have checked the option to Enable third-party browser extensions. You can do this by clicking on the cog icon at the top right, and then going to Internet options and then Advanced. Scroll down and you will find this option in the Browsing section. In some cases, other extensions may prevent Dashlane from working. They may be blocking the local IP address (127.0.0.1) that our application uses to communicate with our browser extension. Note that this is a local address and not a site address. 127.0.0.1 is a computer's default local address. In order to be sure they are not preventing you from using Dashlane, try removing these extensions from your browser, then restarting your browser. If Dashlane works in your browser after disabling the other extensions and restarting your browser, that would mean one of your other extensions is preventing Dashlane from working properly on your computer. Unfortunately, if an extension is incompatible with Dashlane and does not allow you to configure its settings, there is no work-around and we recommend disabling this extension in order to use Dashlane. 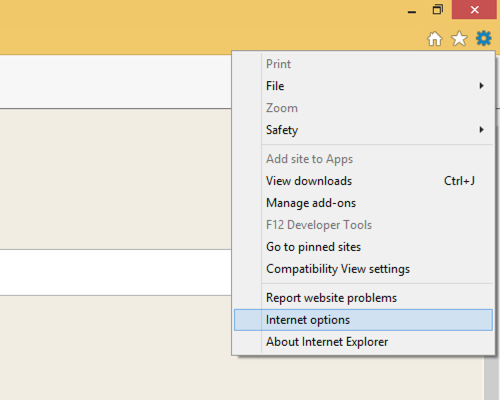 Information on how to do this for Internet Explorer 11 is available here. Please check your Dashlane icon on your desktop or taskbar. If you see a yellow and blue shield on the icon, that means that it's running in administrator mode and won't be able to communicate with your browsers (if you're running your browsers in non-admin mode). Or maybe you see this pop-up in your browser, but clicking on it does nothing? Then you need to do the following steps. Even if you don't see these things, you might want to do the following steps anyway to make sure this isn't the problem. Simply right-click your Dashlane icon and go to Properties. 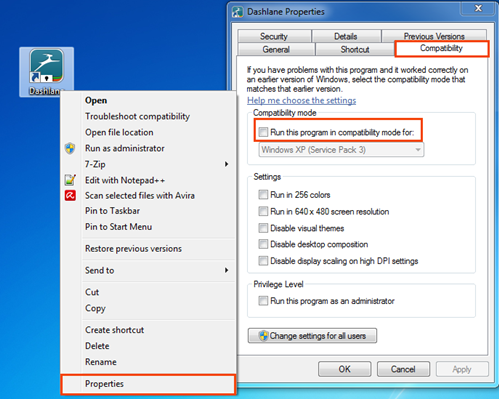 Then go to the Compatibility tab and make sure you uncheck "Run this program in compatibility mode for" and click on Apply. You might also need to make sure that none of the options in Settings or Privilege Level are checked either. Then restart your computer and launch Dashlane again. If you need further instructions, please click here: Do I need to run Dashlane in Admin mode?